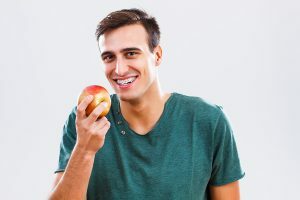 Our orthodontist has the tips and tricks you need for how to eat apples and other similar foods while wearing braces without causing any harm to your appliance. We know you love your apples — Red Delicious, Honeycrisp, Braeburn, Granny Smith, and more! They’re all so yummy and healthy. Did you know that one medium apple has about 20 percent of your recommended daily amount of fiber? We don’t want you to give up your apples now that you have braces. Apples are a delicious and nutritious treat. You just need to make a few adjustments for how to eat apples and other hard foods like them. It’s essential to avoid biting into a whole, fresh apple, as this can cause damage to your brackets and wires. However, the good news is you can eat fresh apples while wearing braces. Simply cut your apple into slices. Typically, slicing it into eighths works best, because then each slice is not too thick. If it’s a really large apple, consider more slices. Tip: To keep fresh apple slices from browning, dip each slice into a mixture of three parts water and one part lemon juice. You can do this in the morning, and your apple slices won’t be brown when you’re ready to eat them at lunch or as an after-school snack. Caramel, while absolutely delicious, is not a recommended food to eat while wearing your braces. The chewiness of caramel sticks to wires and brackets. It can be difficult to remove even with a thorough brushing and is likely to cause damage to your braces. Caramel can even pull a bracket off a tooth. Unfortunately, avoiding caramel is recommended until your orthodontic treatment is complete. This unfortunately means avoiding caramel apples. When you lose a bracket, you can potentially end up with longer treatment times. We want you to have the fastest treatment possible so you can start smiling with confidence as soon as possible. In addition to apples, there are a few other hard foods that also should be sliced when eating with braces. These include, but are not limited to, carrots, corn‐on‐the‐cob, celery, radishes, and anything with a similar hard fruit or vegetable texture. For a complete list of foods that should be avoided or eaten with exceptional care, talk to our Laguna Beach, California, orthodontist. Your new braces will help you acquire the smile you’ve always wanted. To keep your braces in their best shape so they can do their job, it’s important to follow all the care instructions from your orthodontist in Laguna Beach. By doing so, you will get your best smile fast!